Visit Tanzania and take part in hiking the Kilimanjaro via the Marangu route on this 6 Days Rongai Route Kilimanjaro Hiking Safari. Contact us to book this safari. Arusha is the beating heart of the wild – the last port of civilization before heading out into dense jungles and rich savannah plains. The markets of Arusha burst with color, and throng with locals picking up their weekly wares. The numerous cafes sell dark and deliriously good coffee from the plantations, and close by the infamous National Park lures visitors in to explore her evocative Maasai culture and exotic flora and fauna. In the evening you will enjoy a quick briefing which will be conducted by professional Bush 2 City Mountain Guide about your trekking, and to ensure if you are ready for climbing. A guide and a mountain support crew will arrive at the hotel in the morning in order to meet you and hold a quick briefing, after which you will travel by vehicle to Kilimanjaro National Park’s northern entrance: Nalemuru Gate (2,020 m). After the quick formality of acquiring climbing permits and registering with the search and rescue service, the group will start trekking up to Simba Camp (2,625 m). Your trek this day will be moderate and take you through coniferous forest up Kilimanjaro’s northern slope. Remember not to hurry and always keep a comfortable pace. By the time you reach the camp, our professional mountain crew will prepare everything necessary, put tents and cook dinner for you. Take a Diamox pill to help alleviate symptoms of altitude sickness. Most mountain climbers take Diamox in the morning, before they start their ascent, in order to reduce discomfort associated with altitude sickness. We recommend you consult your doctor prior to the trip in case of potential allergies. At night you may experience discomfort associated with acclimatization to the high altitude: because of a reduction in your waking breathing pattern, your body gets less oxygen than during the day. Taking altitude into account, you may therefore start feeling sick and have a headache. Pay attention to your own body and tell your guide if you start feeling any symptoms of altitude sickness. Early in the morning after breakfast, the group will depart from Simba Camp to start trekking towards your second high altitude camp: Kikilewa Camp (3,630 m) where you can see Kibo Volcano at its finest (barring cloudy weather). This trekking is more physically demanding than the previous one, so once you are in the camp, full rest is recommended. Early wakeup, breakfast and the start of trekking to Mawenzi Tarn Camp, which is situated at the foot of Mawenzi Volcano, Kilimanjaro’s second summit. 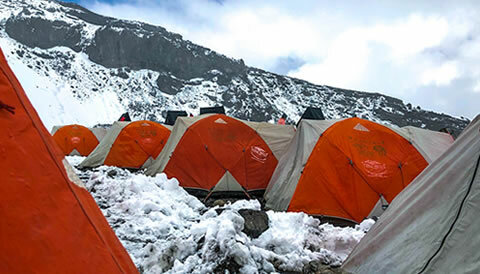 When you reach the camp, you will have lunch and a two-hour rest, after which there will be an acclimatization hike towards Mawenzi Volcano with a 200-meter gain in altitude, followed by a hike back down to Mawenzi Tarn Camp, where you will have dinner in the evening. Note: The acclimatization hike is an easy trek with a slight gain in altitude done in order to speed up the acclimatization process. You should take the acclimatization hikes very seriously. They help increase your chances of successfully summiting Kilimanjaro and save you from the consequences of altitude sickness. This day will be spent trekking towards School Hut Camp (4,715 m). The landscape will change significantly to give way to a rocky semi desert. The actual trekking is not very difficult; just remember to stick with an appropriate pace to keep up your strength for the trekking to Kilimanjaro’s summit. When you reach the camp, we recommend you sleep well, avoid strenuous activity, and drink as much as you can, because that very night you will be ascending Uhuru Peak (5,895 m). Night departure from School Hut Camp (4,715 m) and the start of you’re trekking to Kilimanjaro’s summit: Uhuru peak (5,895 m). The trekking will be moderate from a physical standpoint, but the altitude presents a much more serious problem. For the entire length of the trekking each pair of climbers will be accompanied by their own guide, who will be monitoring your stamina and mental resolve. After your successful ascent to Uhuru Peak, you can descend to the nearest glacier if desired. Then you will return to Kibo Camp and after a two-hour rest continue your descent to Horombo Camp (3,720 m). Note: Don’t forget that 90% of all accidents occur during the descent, including all broken arms and legs. Please pay attention to your feet, as there is a high risk of damaging your toenails. You will be offered a warm breakfast in the morning, after which we will head for the Kilimanjaro National Park’s exit: Marangu Gate (1,860 m). After your descent the whole group will gather to congratulate you, and then you will have the chance to share your opinions on the trip in the guestbook. Lastly, we will present you with your commemorative certificates (in our office) and provide you a transfer back to the hotel. After getting some rest and refreshment at the hotel, your driver guide will take you to the airport ready for your flight back home. End of the 6 Days Rongai Route Kilimanjaro Hiking Safari.